The pallet truck scale PCE-PW 2000 is a mobile pallet truck scale with an integrated scale. You can use this pallet truck scale wherever you need. The pallet truck scale is perfect for commercial trade, commercial transactions or internal use. This model is the perfect solution for fast and precise mobile weighing in industrial sector and warehouses. You can weight and transport your merchandise during the load in the ramp or in the truck. It is no longer necessary to bring the pallets to a verified scale, it will only be necessary to place the goods to weigh and read the weight on the large display of the pallet truck scale. Now you have an opportunity to weigh quickly and with a good control of the process. 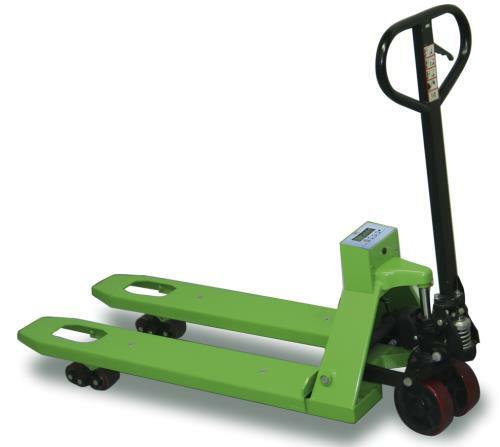 The pallet truck scale is powered by batteries, which make it mobile and easy to use everywhere. The scale has 3 ranges which allow you to reach a high accuracy. The scale shows up to 500 kg in intervals of 0.5 kg, up to 1,000 kg in intervals of 1 kg and in intervals of 2 kg for superior weights. This link shows an overview of the available scales and balances which will meet your requirements. Protection IP 54, resistant to powder and water splashes.